Tanning is dangerous because it requires the increase of UV radiation exposure in order to produce a tan. A tan is created due to melanogenesis of melanocytes. Melanocytes are skin cells that produce the protein melanin. We produce melanin which creates our skin color. When our skin cells are exposed to UV rays, the DNA of those melanocytes is affected and damaged. 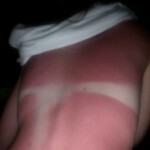 This damage creates the development of a tan. Direct DNA damage due to UV radiation can be seen with a sunburn and by the increased production of melanin (or a tan). Too much of this direct DNA damage will give a painful warning signal- heat and the eventual painful sunburn. In comparison, indirect DNA damage does not cause a tan or sunburn and there is no painful warning signal. Instead, the radiation creates free radicals which can affect surrounding cells. So why do so many people go to tanning salons or sit for hours under the sun’s rays? 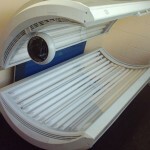 Why do some people install home tanning beds? For many young people, media might play a role. The show Jersey Shore has a motto “GTL- Gym, Tanning, Laundry”. Tanning is a regular occurrence. Why? Because “it makes you look good” as some of the cast explained. But at what cost? Scientists have studied why some people are “addicted” to the tan. As it turns out, tanning causes brain activity changes that are similar in those seen in people addicted to drugs and alcohol. Tanning causes an addictive neurological reward and reinforcement trigger according to the UT Southwestern Medical Center. The study involved 2 groups of people. One group tanned which the scientists measured brain activity. The other group also tanned, but there UV radiation was filtered out. The group that tanned with full radiation showed more brain activity than the filtered group. When asked about how satisfied they felt about their tanning experience, the group that had the filter expressed that their desire to tan was as high as it was before tanning. So knowing the dangers of tanning might not be enough to deter people from doing it. Despite the safer alternative (tanning spray) it might be harder to get people choose that option over the more addictive one. Print article This entry was posted by Jennifer Aiello on August 22, 2011 at 4:17 pm, and is filed under G2C Online. Follow any responses to this post through RSS 2.0. You can leave a response or trackback from your own site. This is such an important topic, and I think it will only grow more prominent in the next few years as more and more media outlets pick up on it. Quite an interesting study.